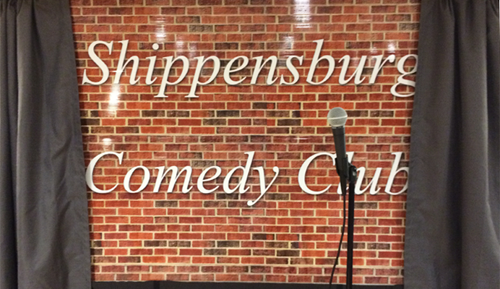 Welcome to the Shippensburg Comedy Club offering shows with nationally touring headliners. We hand pick only the best comedians who are hilarious. Shows are held at the beautiful and luxurious Courtyard by Marriott with a full bar and drink specials. We are located at 500 Newburg Rd, Shippensburg, PA 17257 right next to the Shippensburg University Conference Center. We do not share your information with any other companies. I go to comedy clubs all the time, but I've never laughed so hard in my entire life until this show. Earl David Reed is the bomb! Jesse Blanco was also hilarious! Thanks, Seth, for bringing some life into Shippensburg! So grateful for Seth, I think Shippensburg really needed this. I laughed so hard it hurts. What a great time, every time we go. Just seen Earl David Reed there. This place is what shippensburg needs. I highly recomend taking in a show there. It was really great and a lot of laughs! It's nice having a place like this in town! Had a fabulous time. Enjoyed the meal first..great food! Recommend to all. Laughter is truly the best medicine! Loved the interaction with the crowd! Looking forward to another show!! Great opening show, loved Brad. I would definitely recommend this place! Dinner before was awesome as well. I will return!! Really enjoyed the show again tonight! Donna was hilarious! Laughter is great medicine! Omg?. Hilarious. Thanks for an amazing night of laughs! !